2006. That was the last year anyone could possibly describe our family as “normal.” 2007 and beyond–not so much. Between June of 2007 and March of 2009, our family doubled in size from 4 to 8. All six kids of ours were under the age of six years old. Four of them were still wearing diapers. Goodbye, normal (*shameless plug* read more about that journey in my book). Not too long after, our family grew by one more. Here’s the ultra-short version of that story: our teenage neighbor found herself in a tough spot in need of a change. That change ended up being a move into our house. Hello, insanity. Our life was crazy, and we loved it. Fast forward to 2015. We now have 8 kids at home, ages 11, 9, 9, 8, 8, 6, 1, and 1 month. 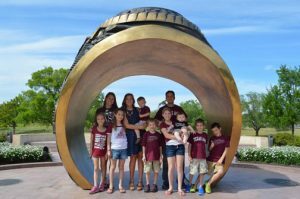 Our favorite teenager is living it up in College Station as an awesome Aggie at A&M. Alternating days to sleep in. We take turns sleeping in on Saturdays. One of us gets up with the kids. The other lays in bed until they feel like getting up. It might be 9:30am. I might be 12:30pm. It’s wonderful. Communication. Hey, ladies, here’s the deal. If you are frustrated that your husband isn’t helping out around the house as much as you would like, try being more specific. For the first several years of our marriage, I thought “clean the bedroom” meant “stack stuff in piles around the bedroom.” Don’t tell your husband, “I could use help around the house.” Tell him, “I could use help vacuuming the floor of the guest bedroom.” or “I could use help moving the dishes from the sink to the dishwasher.” or “I could use help clearing the counter tops, spraying them with the bottle marked ‘cleaner’, and then wiping them off.” I would be willing to bet that, even if you’ve been married awhile, your definition of “cleaning” is different than your husband’s. Sometimes, you need to explain things to us like we’re 5 years old. I’d rather feel a little patronized than have you expect me to read your mind. Thanks. Girls trip. My wife takes a trip with her friends every year. It’s an important trip for many reasons. Here are 2 of them: A) she gets to spend some time building stronger relationships with godly friends who can support her during tough times that may come later on in life. B) her husband gets to be reminded of just how demanding the job of “mom” is. After a few days of frantically trying to feed, bathe, entertain, and keep living all of the children in my life, I’m a lot less overwhelmed by my cushy day job. Also, I’m a lot quicker to do the laundry, cook, clean, etc. when I get home from work each day. Philippians 4:8. Read this post. Staggering bed times. Some of our kids go to bed at 8pm, some at 8:30pm, and some at 9pm. While this doesn’t always create one-on-one time, it does provide a very valuable few minutes where we can give each of our kids our attention in a more focused way. Setting aside time to be together. Our house shuts down at 9. No more cleaning. No more laundry. No more housework. It’s time for the two of us to have an uninterrupted conversation. Sometimes, dinner doesn’t get completely cleaned up. Sometimes, laundry takes over our couch. It doesn’t matter. There are more important things in life. Also, a couple ladies in the MOPS group asked about Third World Thursday. Here’s the link that we mentioned to Mary’s blog: https://thirdworldthursdays.wordpress.com/home-page/. You can find a variety of recipes here. Check it out! One more thing: though it wasn’t part of our talk, Patcine took a little bit of time at the meeting to talk about her ministry, The Will to Choose. What a powerful ministry to those affected by the loss of a child. If you or someone you know has lost a child, I strongly encourage you to check it out. Next post College Station Road Trip 2015. It could've gone better.